See, the foods that call to me are a kind of food. Two kinds, actually. And really, I don't have a problem with these foods normally. It's just when they're around. In abundance. Like during the holidays. Or after you've thrown a party. Or when you're moving into a new neighborhood (like we're doing), and all the nice neighbors clearly think that you're not yet fat enough to live on that street, so they bring cookies. You see, I control my cravings by controlling my environment. The foods I crave are generally unavailable in my house on my orders. Because I work from my house. I'm often there 24 hours a day! So when there are 4 half full cookie platters sitting in the kitchen and I'm in the office, I can hear them calling to me. The aluminum foil wrapped around them doesn't lower their voices even a bit! Those remaining 14 and a half servings actually exert a gravitational pull that draws me off of my desk chair and into the kitchen. Never mind that I've asked my wife to hide the bowl from me. The gravitational pull guides me right to it! Then I start devouring the trail mix - not by the handful, but by the serving - 1, 2, 3 (starting to get embarrassed), 4, 5, 6 (starting to get full), 7, 8, 9 (starting to get sick). Then I leave what's left, only to come back in an hour and finish it instead of lunch. And let's not even talk about Michael Seasons' Cheese Puffs. You've heard of reduced fat cheese puffs? 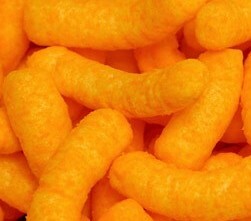 These are (I'm not kidding) increased fat cheese puffs. This Michael Seasons guy must be a real sociopath! Comments for I can't name just one! I know who you are and I know where you live. I'm coming over there, empty-handed, so I can't be blamed when you lack self-control! Together we will set up a container marked "Food Not Bombs" outside your front door for people bearing tempting treats. We will mark the box 'organic" so they will get the message. We will add organic foods to the box and then deliver the contents on Mondays, Wednesdays and Saturdays to Congress Street at Scott, across from Wig-a-rama in downtown Tucson, to be used in the fixings. Get ready!